Interior decoration is not one of my strong suits either, unfortunately... So, when we finally decided to drag out the Sailrite and get to work on that curtain project I've been studiously avoiding, the hard work had already been done! Choosing our mounting method proved to be most difficult for us, and the reason for my procrastination. 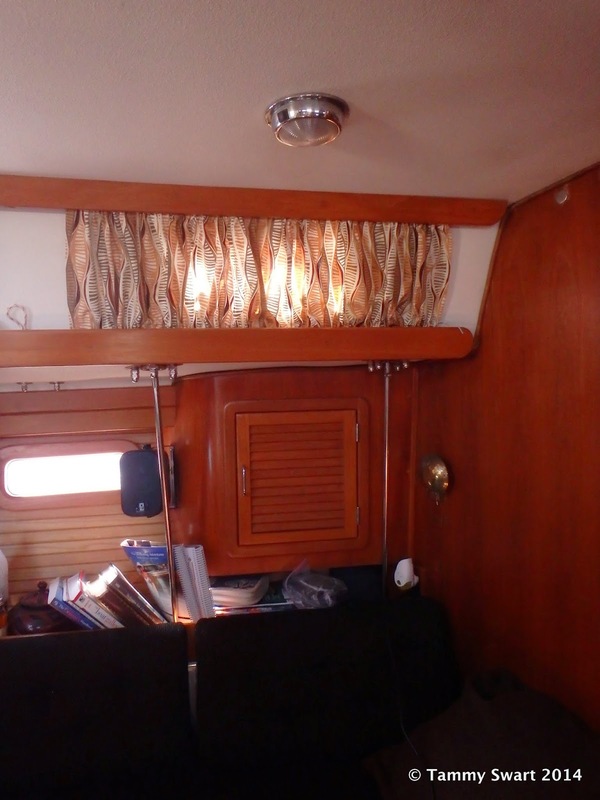 I've seen so many great ideas for boat curtains, but it wasn't until we visited Dave and Melinda on our sister ship Salt & Light, that we found our method of choice. They used dowels and cup hooks (I think), hidden behind the hand rails, to mount their curtains. No drilling holes in the cabin liner! But, when we started looking for the materials to use at the local home stores, we couldn't find any type of dowel that would be flexible enough to fit our curved walls, but small enough to fit in the tiny space. We didn't want wood... So, we ended up with eye hooks and string, strung tightly between the hooks. I wanted to avoid lining our curtains, thinking that it would make scrunching too bulky for the small space. So, we needed something that was heavy enough to provide privacy, but wouldn't make the cabin too dark inside. We had to find something that would coordinate with our existing upholstery fabric (which is very dark) and provide some lighter tones to brighten the place up. Bruce said "flowers are OUT", and since he voices few opinions, I was happy to oblige. 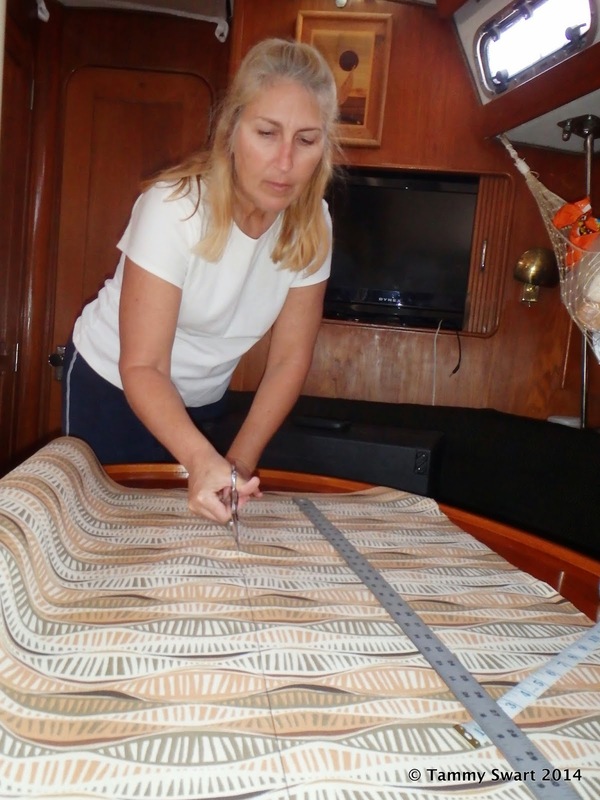 Many of the patterns Bruce liked (sailboats, maps) would have looked messy when scrunched. We paced up and down the fabric aisle until we lucked onto the perfect fabric. How much fabric to buy??? I had taken some rough measurements with me to the fabric store and threw myself on the mercy of the lady working the cutting table. I told her the approximate width I would need covered, and the approximate height. Add additional width for scrunching (she assumed 2-1 but that was too much - I ended up using half again the width for each panel). Add height for my seams, throw in some extra for mistakes and maybe some accent pillows later... divide it all by the width of the fabric roll... and VOILA! We walked out of there with our roll of fabric. Back on the boat, the next challenge was to work out the spacing. We considered how much room there was between ports and where we would scrunch the fabric when we open them. Split in the center and too much fabric! Once we finished with the first panel, I revised my plan. We ended up having longer panels and sliding them to the large spaces between ports. The first panel (pictured here) was done with 2/1 material width... It was just too bunchy, so all of the other panels used width + half width, which I think turned out to be plenty. I sewed and mounted each panel before moving on to the next. That way, I could make sure that each one fit the way I wanted it and apply changes as I went. I measured the height at each end, laid out my material, measured and marked it for cutting. Two of my panels were shorter at one end, so I had to make a slight slant... Luckily, the scrunching made this pretty forgiving so it wasn't much of a problem and I made the slant in the seam instead of in cutting the material. The sewing was the easy part! I hemmed each edge first, then folded, measured and pinned my top and bottom seams. Since I only had a thin string to run through the top and bottom of each panel I made 1 inch seams. That way they could hide behind the wood rails. When done sewing a panel, I used a safety pin to easily run my string through. We did the main saloon over two days and we're so happy with the way it turned out! The boat looks more homey and inviting and we now have more privacy when staying in a marina. I can also block out the glaring sun when I'm trying to cook! Oh man! I bet that makes a huge difference. I sailed boat one time that had no curtains and let me tell you, they make down below really feel better. Great work, they look nice.